Anyone who has read any of my fiction will not be surprised to learn I like clambering over old ruins and finding out about how ancient cultures lived and thought. So when I had an opportunity to visit Newgrange recently I was very interested in the spiral carvings on the stones around it. Why spirals? No one knows. I’ve seen suggestions they, or other spirals, signify water. Either showing the waves of a stone dropped into a pool or maybe even the turbulence produced when you push your hand through it. 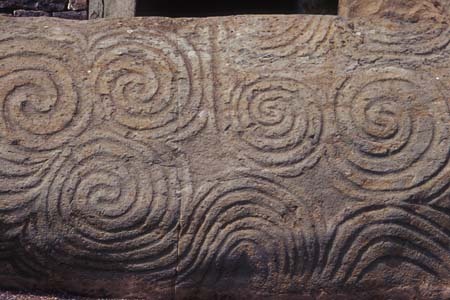 Newgrange spirals often come in threes, looking a bit like clover leaves, and may have influenced St Patrick’s choice of that symbol. Three spirals strengthen the argument for water because you do get multiple twisters in the water when, say, you paddle through it. So water might be a good candidate. But what exactly does water have to do with Newgrange? Other than the fact it was raining the day we were there. The Newgrange burial mound is a curious thing. It was built as a passage tomb, a great earthwork on top of a hill with a narrow passage in one side. At the end of the passage were laid cremated human remains of a dozen or so people. Then the passage was sealed with a very big rock that has been chiseled to make a good fit. Above that a small opening was left and the small opening is what makes it so interesting. For a few days either side of the winter solstice, as the sun rises, it shines down the passage to the very back and illuminates the floor. It doesn’t last long and no one is supposed to see it because the builders sealed the door. Building this huge mound took several generations. The large rocks at the base were sourced from nearby,the smaller ones from 100km or so away. We don’t know if the burials were done at the early part of the construction or at the end or maybe progressively as it was built. There are two similar structures nearby. One does the summer solstice, the other does both equinoxes. Clearly these things were not built to tell the seasons. Apart from the fact they were sealed up it is obvious the people who built them could tell when the solstices etc were going to happen already or they could not have built them. It is the second image on the top row. Someone with a better eye than mine figured out the image because that stone as been damaged too much to show up in my photos. The image shows two axes and a triangular thing that looks like a dunce’s cap. Which is mildly amusing as funny hats are but this hat is special. Four of them have been found in Germany and France, all dated about 1000BC to 2000BC which is a similar time to the Kungsgrave. They are found with axes like the ones in the carving so scholars are fairly certain the Kungsgrave carving is a hat like the one in Berlin. Such hats are much more than they seem, making such an item is enormously tricky and then there are the designs on them. Even so there’s evidence they were widespread, ie more than 4 were made. There are clay figures from Cyprus that seem to be wearing similar hats. We might imagine a widespread fashion across Europe for such hats but, being hard to make and using gold, they would be valuable. They were also useful. These were the computers of their day. The detailed designs on them describe the solar and lunar calendars in detail. There are symbols for the sun, moon, venus (a crescent, must have been a naked eye observation too). And the symbol for the sun is…a spiral. Why a spiral? Who knows? There’s a long time difference between Newgrange and the gold hats, but the old spirals are carved in stone. What if there was a common understanding across Europe, all the way to Ireland around 5000 years ago that a spiral was code for the sun? 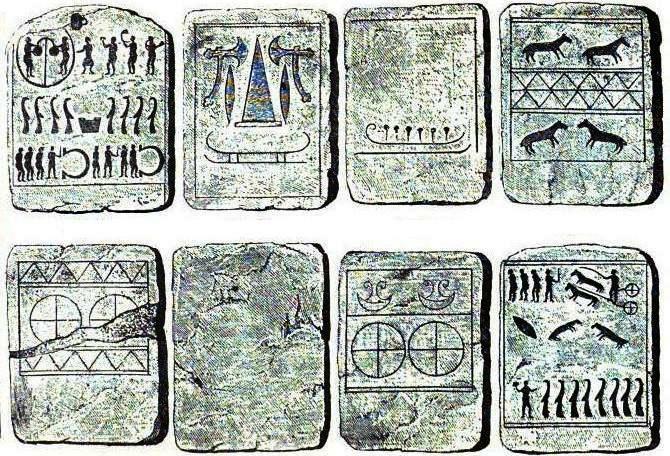 That understanding could persist because people had stone examples to refer to. A couple of thousand years later they are still making passage tombs but they’re not carving spirals on them, not in Kungsgrave anyway, but they do have gold hats. And those hats have spirals that are definitely sun symbols. But why would they like to carve triple spirals? I’m not sure they always did. The stone outside Newgrange, and the one around the back of it seems to be a riot of spirals. But three makes sense in that they needed three mounds at Newgrange to deal with the two solstices and the equinoxes. If they thought of the sun doing as doing three things then it works quite well. These symbols, especially the triple spiral, are thought of as Celtic and they are because the Celts, especially the Irish, adopted them. The people who made Newgrange, Kungsgrave and the hats were there before the Celts came along.